Selyodka Pod Shuboy (Селедка под шубой) literally translates to Herring Under a Fur Coat or Shuba Salad (шуба). It’s a much loved Russian meal especially popular during New Year celebrations. A Russian shuba is a warm winter fur coat worn in Russia for hundreds of years. 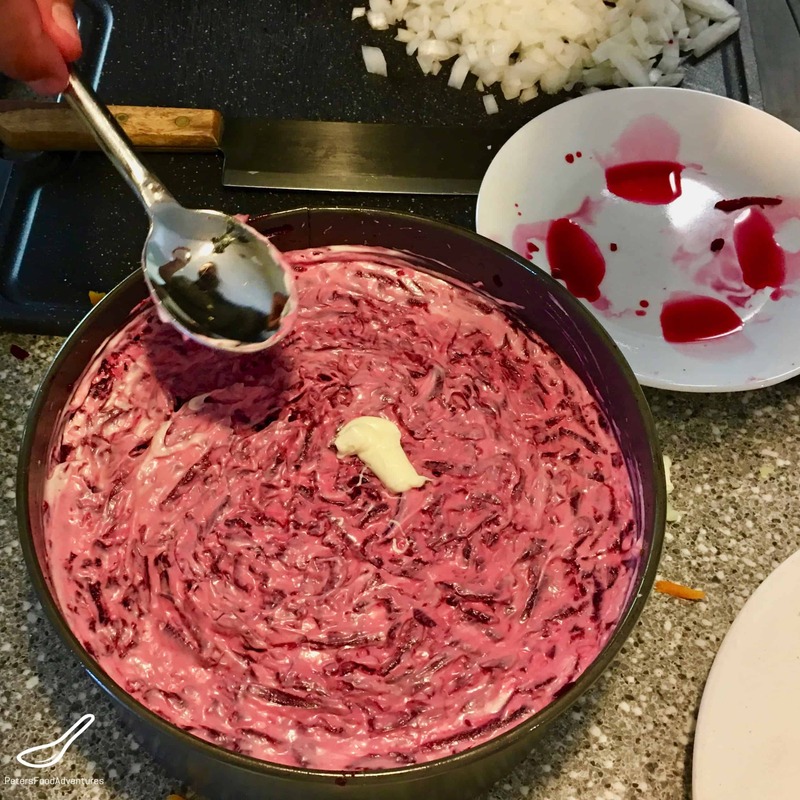 Herring Under a Fur Coat consists of layered potato, herring, carrots, beets, lots of mayonnaise and grated egg which makes the dish look like it’s covering the herring by a fur coat (a bright purple one). In North America, we are used to celebrating Christmas as one of our biggest celebrations of the year. However in Russia, it’s the New Year that is the biggest celebration. I’m sure this is due to former communist times as an atheist state, banning Christian Christmas celebrations. Instead they chose to focus on celebrating the New Year. Christmas in Russia follows the Julian calendar and is celebrated on the 7th of January. New Years feasts always included Herring Under a Fur Coat, Piroshki, Kholodets, Olivye (Olivier Salad), a popular honey type of cookie called Pryaniki and more! This is classic Russian food at it’s best! You will either love Herring Under a Fur Coat, or you will hate it. The Russian climate is suited to growing root vegetables, and beet and potatoes feature heavily in our culture. Russians also have a love affair with mayonnaise, heading back to imperial Russian times. Herring Under a Fur Coat is a perfect marriage of ‘very Russian’ food tastes. You need a springform pan to make this layered salad. Some people make it in a bowl or casserole dish. Don’t be scared of the mayo! Russians love mayonnaise. I have 3 layers of mayonnaise in this layered salad, some people prefer to have only 2 layers of mayo. I kind of try to limit the use of mayonnaise, don’t worry and be generous with your mayo quantities. My recipe really uses the minimum mayo when making a salad of this size. I also add salt and pepper in the middle of the salad. 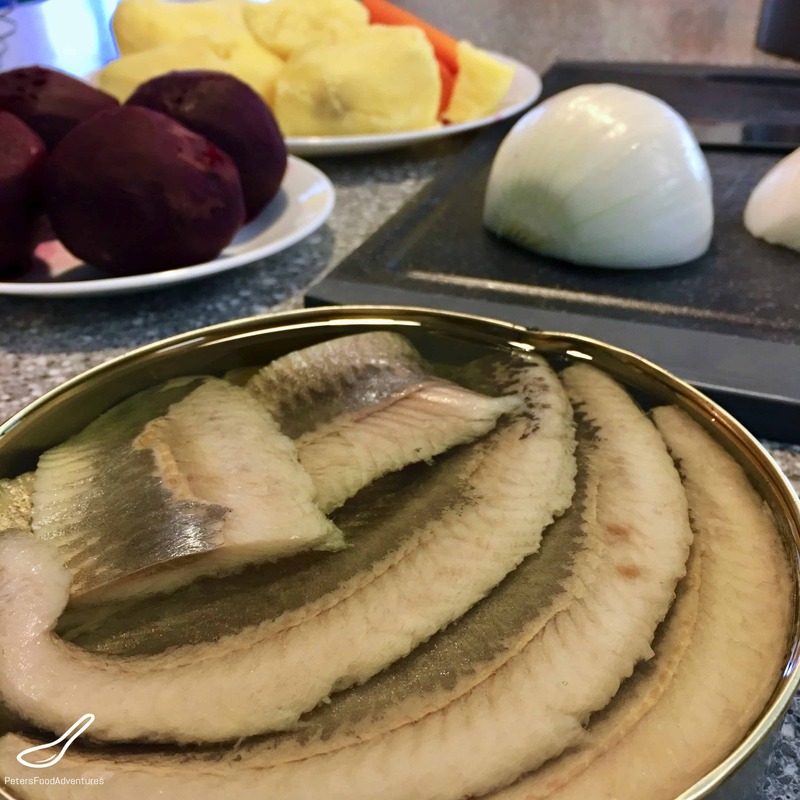 Quite often Herring Under a Fur Coat seems under-salted to me, so don’t be afraid to add a solid teaspoon of seasoning. It’s quite easy to build this salad, just prepare all the ingredients in advance. The dill is optional as a garnish, however I think it’s adds more flavour and looks great. My last tip is to speed up the cooling time of the vegetables, simply put them into the freezer until they are cool. You can prepare the vegetables in advance and simply grate and layer your salad when ready. Oh, and most recipes tell you to boil the vegetables unpeeled, then peel them after they are cooled. Have you ever tried to peel a soft carrot? I peel everything first, then boil them and achieve the same result. Save yourself some time and frustration! Although you can make it the traditional way, boil them all unpeeled then peel the soft vegetables. I love Herring Under a Fur Coat, easier to make than it sounds. Everyone needs to try it at least once! I make a version of Shuba Salad with Salmon that tastes awesome too. A Russian classic, Dressed Herring is enjoyed at every celebration. Bon Appetit! Приятного аппетита! In a saucepan, boil the peeled potatoes and carrots for about 20 minutes, or until they are soft. Allow to cool and set aside. In a separate saucepan, boil the peeled beets for about 45 minutes until they are soft. The time will depend on the size of the beets. Allow to cool and set aside. Cook the eggs until they are hard boiled, for about 10 minutes. Allow to cool, peel, and set aside. Slice the herring fillets into small bite size pieces (cubed or diced). Set aside. Finely dice the white onion. Set aside. If you are using yellow onions which have a sharp bite, put them in boiling water for 2 minutes then strain before using. This will reduce the bite of the yellow onions. On a serving platter, springform pan or glass deep dish, start to layer your ingredients. Grate 1 peeled potato over the dish and evenly spread across the entire base. Add the finely chopped onion, spread evenly over the grated potato. Put the chopped herring evenly over the onions. Add a few tablespoons of mayonnaise, using the back of the spoon to thinly spread across the dish, pressing into the herring. Grate the remaining potatoes over the mayonnaise mixture and evenly layer across the dish. Sprinkle salt and pepper to taste. Grate the carrots over the potatoes and lightly cover with another layer of mayonnaise. Finally, grate the beets evenly spread over the carrot mayo layer, and cover with the remaining mayonnaise. Grate the eggs over the entire Shuba salad. Keep refrigerated until you are ready to serve. Best prepared the day before serving, but allow at least 3 hours in the fridge so the entire salad has had time to chill. Garnish with chopped dill before serving. Here is the easy order of layers - Potato, Herring, Onion, Mayo, Potato, Salt and Pepper, Mayo, Carrots, Beets, Mayo, Eggs. Well, it looks beautiful, and I love pickled herring. Not sure if I’ll be able to find the whole filets, but grocery stores are carrying more and more all of the time. Thank you for sharing the recipe. Thanks for checking it out Amy! Try Euro delis and look for herring in oil! Good luck! ???? This dish looks so delicious! I’m not sure I’ve ever had pickled herring. Thanks Jeff! Herring is very popular in Eastern Europe, works great in this dish. Thanks for checking it out! OMG…… I accidentally stumbled upon your video and I was pleasantly surprised to see you cooking Russian food 🙂 You were not even born in Russia or Ukraine and you speak and write Russian, that is absolutely amazing….. Just wondering if your kids can speak the language? LOVE shuba and thank you for delicious recipe. Hi Angelina! Thanks for checking it out! Being the child of immigrant parents, Russian was the language we spoke at home. Yes, my kids speak Russian as well, it’s just easier when everyone understands the same language of your culture! Glad you enjoyed the video, love Shuba as well! ???? Hey Ginger! Thanks so much for checking it out! I love eating Shuba, try making it with Salmon if you can’t find herring! All so good! You are definitely a mayo lover, lol. Interesting, how everyone assembles it differently. Placing little bit of potatoes on the bottom is a great idea, it probably holds cut herring pieces in place. I will try it next time. Thanks for checking it out Karen!! ??? ?